The 2015 Canada Winter Games is proud to offer a new mobile website developed in collaboration with OPIN. The new mobile experience will allow users to access information about Canada’s largest multi-sport and cultural event. The new website, which has been customized for today’s latest smartphones, allows users to purchase tickets, navigate the grounds, and find specific venues and events. The redesign also gives users quick access to scores, metal standings, and player profiles. 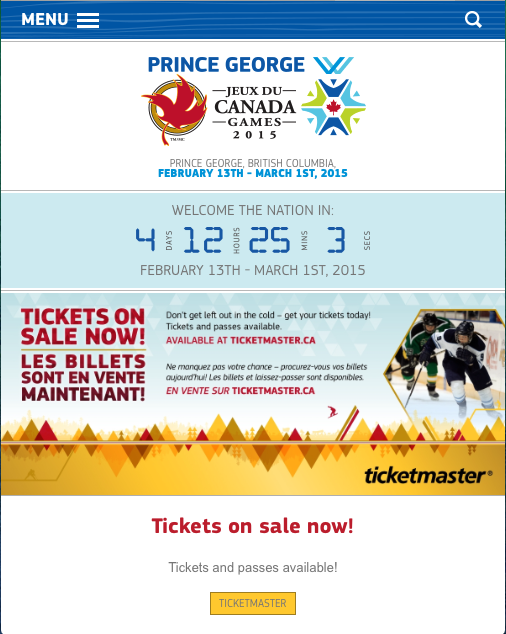 The 2015 Canada Winter Games runs from February 13 to March 1 in Prince George and Northern British Columbia. The venue will host 2,400 athletes, 1,000 coaches and officials, up to 4,500 volunteers, hundreds of media and thousands of visitors.